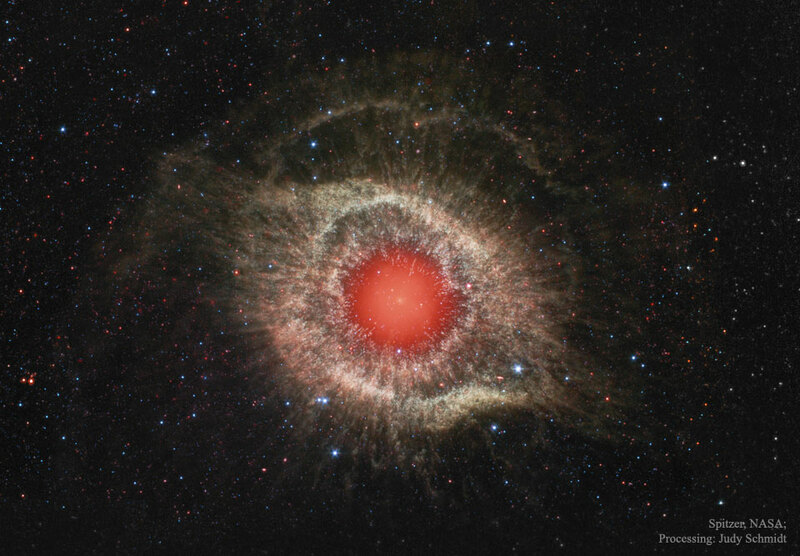 Explanation: What makes this cosmic eye look so red? Dust. The featured image from the robotic Spitzer Space Telescope shows infrared light from the well-studied Helix Nebula (NGC 7293) a mere 700 light-years away in the constellation of the Water Carrier Aquarius. The two light-year diameter shroud of dust and gas around a central white dwarf has long been considered an excellent example of a planetary nebula, representing the final stages in the evolution of a Sun-like star. But the Spitzer data show the nebula's central star itself is immersed in a surprisingly bright infrared glow. Models suggest the glow is produced by a dust debris disk. Even though the nebular material was ejected from the star many thousands of years ago, the close-in dust could have been generated by collisions in a reservoir of objects analogous to our own solar system's Kuiper Belt or cometary Oort cloud. Had the comet-like bodies formed in the distant planetary system, they would have survived even the dramatic late stages of the star's evolution.